Special Services – Ee-Jay Motor Transports, Inc.
Ee-Jay’s experienced staff is regularly utilized by customers to assist in the evacuation from or transfer within their plants. We regularly provide load adjustment services for our customers by either transferring material from one compartment of an en route railcar to another or by removing the material and relocating it to another of the Shippers railcars which will frequently be located at our terminal. 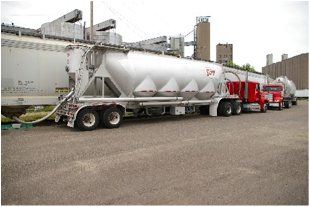 In the event of water being introduced to plastic resin via a flood or leak Ee-Jay is able to use pneumatic self-loading trailers to dry out a railcar or silo. Ee-Jay is qualified and is a registered provider of salvage services to the Union Pacific Railroad and BNSF Railway Company and holds itself out to any party in need of liquid or dry bulk salvage. 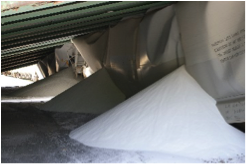 Because of its long history and ongoing relationships with virtually all plastic pellet and powder petrochemical producers, including the largest and most significant plastic brokers and resellers, Ee-Jay is uniquely positioned to provide “one stop shopping” in the matter of rail wreck cleanup and salvage services. The National Transportation Safety Board, Homeland Security, various state and local Departments of Public Safety, state Departments of Transportation and state Pollution Control Agencies are some of the governmental entities Ee-Jay has worked with in the course of salvage operations. Ee-Jay has an acute awareness and understanding of the environmental concerns that surround such accidents. 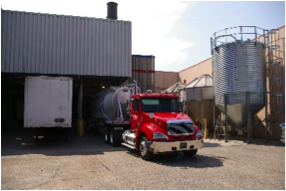 We are regularly qualified and updated by our producer and reseller customers alike in the “best practices” that attach to plastic handling, spill remediation, pellet capture and disposition.